“The Haunt Veil” is a little something cooked up around these parts on Ultimatehaunt.com. “There are many versions of what the symbols of Halloween are and where they originated, but the basic truth of it is the same. Halloween is the Christianized name for So – win. Spelled S-A-M-H-A-I-N. It was the highest of holy days in the ancient Celtic calendar. It literally means, summer’s end. Samhain marks the end of the year, the drawing to a close of the cycle of life. Samhain is the last harvest festival. The final crops have been brought in from the fields, God has begun drawing a blanket over the world. It also marks the beginning of the year, and was marked with great bonfires in the fields and bogs of the ancient British Isles. It was the time to end and start again. Throughout the year, the spirits of these residents haunt the various parts of the park. The Haunt Veil shields the spirits, making the “mortals” (guests, tourists, employees, etc.) oblivious to their presence. In other words, the Veil is a wall that covers mortals’ eyes from that of the preternatural and ghostly. As the month of October rolls around, the Veil begins to thin and clues of the restless spirits begin to merge into the vision of the mortals. By the time October hits, the spirits have returned to their full and physical selves. Although the Veil disappears in the month of October and is present throughout the rest of the year, some of the stronger spirits will let their presence be known to those mortals who are willing to see them. Their presence might be something as slight as a moving shadow from the corner of your eye while you’re in line for the Calico Mine Ride or as obvious as seeing a mysteriously floating candle in the second story window of the Gold Trails Hotel. Boot Hill is obviously the main “vortex” as it were, and tourists can even feel the “beating heart” of one of the residents (although, a little known fact is that the actual “beating” one feels is NOT a beating of a heart, but is actually the rustling of about 75 restless members of the undead, hitting, punching and beating the Veil, trying to break through to the mortal side. The inhabitants of Boot Hill are so far down in the ground that on the surface, their endless efforts are faded, sounding very familiar to that of a human heartbeat). According to the folklore, during the key year, 1885 (if you don’t believe us, look at the year stated on the “Ghost Town” sign) marked a very important event…more importantly, it marked a very important mistake from the Hanging Vigilante of Calico. Earlier in the year, during the Summer of 1885, mysterious events began to occur throughout Calico – Children became ill, livestock began to die off, crops went bad, the silver mine dried up and bad luck all around began to stain Calico. These occurrences began to increase in their intensity and damage as Summer ended and Fall began. Over the next several weeks, the citizens of Calico met at the Ghost Town Town Hall (there on School House Road) to find a solution to these problems. The citizens eventually all agreed that the misgivings happening throughout Calico were due to witchcraft. Various citizens were brought in for questioning. A woman named Sarah Marshall was finally accused of the negative wave sweeping over Calico. But wait! There is another part to this tale! ‘There once was a time, not that long ago, that demons and evil spirits were known to stalk and terrorize the good settlers and natives of the west. As legend has it, the only way to silence these demons was with the powerful shot of a Silver Bullet. 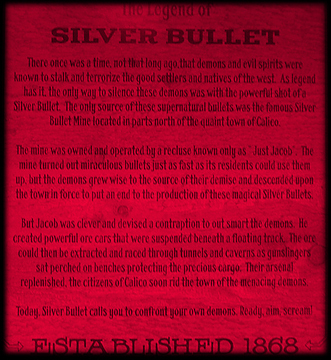 The only source of these supernatural bullets was the famous Silver Bullet Mine located in parts north of the quaint town of Calico. The mine was owned and operated by a recluse known only as “Just Jacob”. The mine turned out miraculous bullets just as fast as its residents could use them up, but the demons grew wise to the source of their demise and descended upon the town in force to put an end to the production of these magical Silver Bullets. Although the ore carts are still in use today, Jacob, along with the other residents of Calico, were no match for the Witch who would curse the town 17 years later. The demons, otherwise known as Lycanthropes, obtained their revenge on the gunslingers, the town of Calico and most importantly, of “Just Jacob” himself. Many Lycans were slaughtered during the ore cart raids, but you know what they say, ‘you can’t keep a good wolf down’. Many were lost and only a few survived…. Now, allow us to return back to the Witch, who we last left with a noose around her neck and black hood over her face…. Just as about the hangman was to pull the switch and hang Sarah Marshall, a burst of smoke enveloped her and from the smoke, she appeared with a horrific laugh, throwing off the noose and the black hood, her mouth stretched back revealing a cursed smile, twisted with angst and hate. She then screamed several powerful words…. She cursed the town of Calico into eternal damnation. Every October the dead would rise and the true “ugly” selves of the citizens would be “unveiled”. Part of the curse of course, was that the new “versions” of the Calico citizens all craved blood…but due to their damnation, a veil, or wall if you will, is placed in-between them and the guests of the Haunt. That’s why these creatures will always go for you but can’t actually touch you. They want ya, but can’t have ya. Their quench is strong but they’re all doomed and that Witch did a number on some of those citizens. Not the most pretty bunch you’ve seen. It is rumored that the reason the Witch spoiled the town of Calico in the first place was because of what Jacob did to the creatures in the mines. Evidently, she didn’t like that very much and felt that Jacob, along with the rest of Calico, would have to pay for the slaughtering of the Lycanthropes. 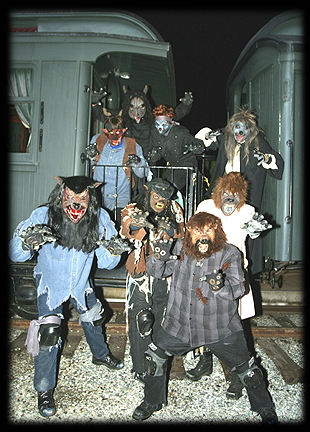 Walking through Halloween Haunt, you’ll see that many of the faces are those that resemble animals. Well, it’s because those particular creatures wear their true selves on their face. 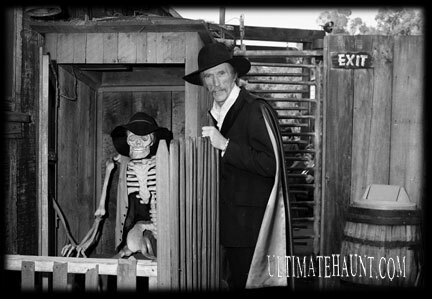 Most of the remaining citizens call Boot Hill home and are simply the walking dead – or undead, if you will. So, you might be asking to yourself – well, Knott’s Berry Farm had been around for many years without any issues with the supernatural. Why did all of these hauntings pick up all of a sudden? Well, here is the explanation as we understand it: Another rumor is that during the curse, the Witch wanted the townsfolk to really pay for what they did to the Lycanthropes, so she banished all of them into Boot Hill for 88 years before they could rise again. A “chosen one” would unlock the key to Boot Hill before they could come out. Apparently this “chosen one” would have to visit the old local town shack and simply open the door to the outhouse and the dead would rise. As it turned out, the “chosen one” was a person named Larry Vincent and in 1973, 88 years later, he opened the outhouse door inside the Haunted Shack, which released the 88 year curse and the dead would now rise, beginning the annual tradition known as “Halloween Haunt”. All of the mazes (and other Scare Zones, past and present) have spawned through the years one by one, based upon this little act of hanging (or lack thereof) the Witch. The mazes work as a centralized vortex into an evil place and time formed around this curse. The Witch certainly helped to solidify the situation poor ol’ Calico found itself in, but you see, the town had to be cursed no matter what the townsfolk or Jacob did. It was simply meant to be. Once the curse had been placed, an incredible massacre was known to have taken place in the local hills of Calico at the logging camps, known by the locals as the “Great Red Moon Massacre of 1885”. Now, many of these creatures can be found here on Ultimatehaunt.com. Their presence is known in these parts and the website works as a mediator between the living and the dead. 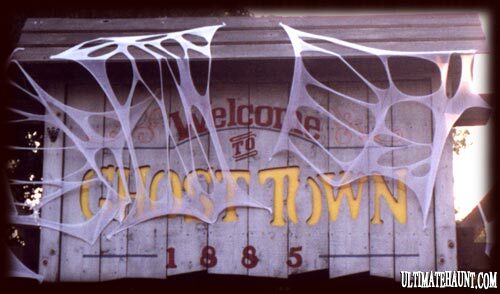 However, one important note: Not ALL of the Haunt Monsters are restless spirits and do not reside in Ghost Town or in Boot Hill. Perhaps they’re under beds, in closets, in the back seats of cars, dark forests, moss-covered castles, etc. Now, the curse has begin to make its way into other parts of the United States and not just limited to Knott’s Berry Farm now. In other words, no matter where you are reading this, you never know if you have one of these creatures creeping behind you right this second or not! Rest assured, no matter when you visit the Halloween Haunt, they’re there …among us.